Metal operas with various characters and singers etc are always an ambitious affair, which in the best of cases turns out to be like Avantasia and in the not as good cases turns out to be like Avantasia. Early and later Avantasia respectively, that is. 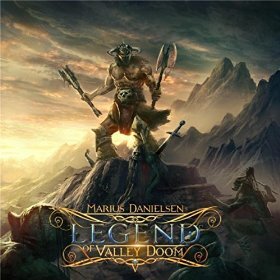 Ever since Tobi Sammet reinvigorated this particular genre, similar projects have sprouted up left, right and centre, and one of the latest to join in the fun is Marius Danielsen’s Legend of Valley Doom. 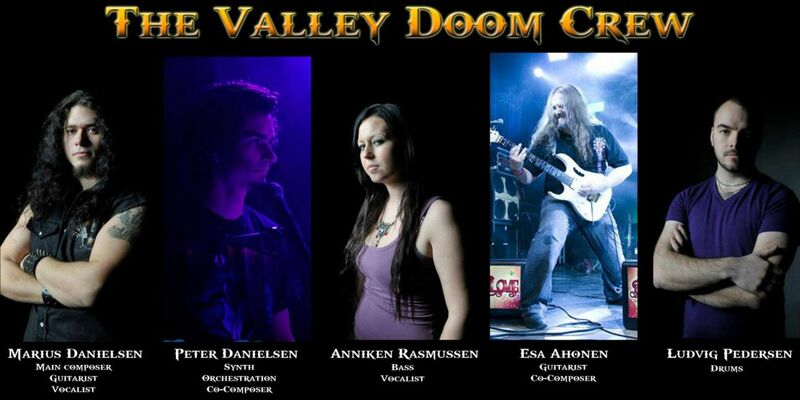 Behind this mouthful of a name stands Norwegian guitarist Marius Birkeland Danielsen and he has assembled a truly remarkable list of guest musicians to aid him and his four cohorts in the realization of his Legend of Valley Doom Part 1. Ten years in the making, the album is as ambitious as it seems and just looking at some of the names involved makes it clear that Danielsen and his brother Peter are serious about this: Mike LePond (Symphony X), Chris Caffery (Savatage/Trans-Siberian Orchestra), Ross the Boss (Manowar), Timo Tolkki (Stratovarius), Tim “Ripper” Owens (Iced Earth/Judas Priest), Mark Boals (Malmsteen), John Yelland (Judicator), Jonas Heidgert (Dragonland), Edu Falaschi (Angra)… Quite the illustrious troupe, but all ambition and all big names are for naught, if the quality cannot keep up. And while it widely fails to innovate, Legend of Valley Doom Part 1 will not disappoint any fans of early Avantasia, (Luca Turilli’s) Rhapsody (of Fire) and the likes, because it has everything one could look for in an endeavour like this. Epic melodies, bombastic arrangements, soaring guitars, a host of excellent singers, varied tempos and rhythms and overall cohesion that holds everything together. What sets Legend of Valley Doom apart from many similar projects is the fact that the song never is subjugated to the story, but is allowed to organically flow and never feels overwrought, which greatly enhances the listening pleasure. After the predictably cinematic intro, “The Battle of Bargor-Zun” gives the listener a good idea of what the Norwegian’s creativity has in stock, double-bass driven, grand and catchy and all, but once the compositions take on the more widescreen approach and run the whole gamut of speeds and intensities, this project really comes to life. Varied “Prophecy of the Warrior King”, epic “Mirror of Truth” (which has more than one Maiden touch, especially in the chorus, where the vocals have a few Dickinson-tangents) and straight up “Haunting My Dreams” all lead up to the album’s centerpiece, the 14-minute title track, and Legend of Valley Doom fully deliver on the promise. despite its exorbitant length of more than 14 minutes, it has bombast, narration, different characters and vocalists, sublime melodies, dynamics, flow and variety, all coming together into the ultimate epic track. While, as mentioned, Legend of Valley Doom Part 1 will not win any awards for most groundbreaking album, but that does not take anything away from the fact that the ten years of sculpting this project have produced an outstanding and dense effort that will appeal to any fan of early Avantasia and the different incarnations Rhapsody, but without ever sinking into the pretentiousness many like projects often display. Without a doubt one of 2015 finer power metal releases it definitely whets the appetite for the second part, which hopefully will not take another ten years to see the light! This entry was posted in Reviews and tagged 2015, 9, Angra, Avantasia, concept album, Crime Records, dragonland, edguy, Epic, Fantasy, iced earth, judas priest, Judicator, Luca Turilli's Rhapsody, malmsteen, manowar, molde, norway, power metal, rhapsody, Rhapsody Of Fire, Savatage, Stratovarius, Symphony X, trans-siberian orchestra.